« the post before: Toothpastery is now dead to me. So, the work continues on Knit2. Almost all of the work at this point is on Michael’s plate–perhaps it’s a bit of a buffet . We have authenticating, image uploading, email sending, and profile updating on the development server. After I finished knitting my horizontal, striped, seed-stitch scarf out of all my Christmas yarn scraps, I needed to busy myself with something. I decided that we needed Knit2 business cards. Then, I realized the Knitters2 needed job titles. Michael has decided that he wants “Developer.” For the most part, he wanted to be left alone to work and not be asked repeatedly what job title he wanted. There were quite a few contenders for my job title after I started soliciting suggestions. Rear Admiral Knitter, Field Marshall Knitter, Chief Knitting Officer, Chief Knitting Architect, and Founder (my least favourite) were all contenders. To sum up: Michael is working very hard. I’m the world’s first Chief Knitting Officer. The business cards are on their way, too. 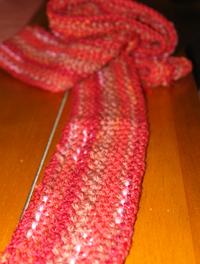 This entry was posted on Tuesday, January 23rd, 2007 at 5:25 pm	and is filed under Knitting. You can follow any responses to this entry through the RSS 2.0 feed. Both comments and pings are currently closed. Yay, Chief Knitting Officer! I look forward to the site. Also that’s a lovely scarf. You have more patience for seed stitch than anyone I know.